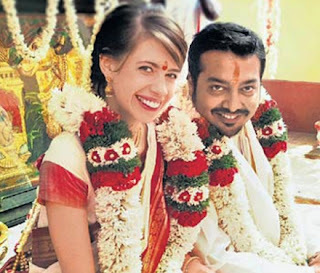 Finally, Anurag Kashyap and Kalki Koechlin have solemnized their long relationship with a wedding. They are now husband and wife. The wedding took place on Saturday in Kalhatty on the outskirts of Ooty. It was a very private affair attended only by close relatives and friends of the couple. Anurag’s brother Abhinav Kashyap (director of Dabangg) was there. Kalki’s mother, brother and sister-in-law were there too. From what we hear, it was a traditional south Indian wedding done with proper religious rituals. Anurag, hardly known to go by the rulebook, followed all the rituals and recited the mantras and shlokas. Kalki wore a white sari with zari work; Anurag was dressed in white kurta and dhoti. This is Anurag’s second marriage after divorce from his first wife Aarti. He also has a daughter from his first marriage.